The Montezuma Oropendola (Psarocolius montezuma) is a New World tropical bird and I've been getting quite a show from the colony that is nesting here at La Selva Reserve in Costa Rica. Male and female both have loud calls, but the male's display that seems like he's pretending to be a monkey swinging on the branch, is what keeps your attention. I've been here 8 days now and I am still fascinated by the show. There are definitely those who outdo others. Some just don't take the dip far enough, and others look as if they're playing "dead man's fall." I just don't know how they can get themselves back up again so gracefully. The males engage in fighting and aggressive displays, competing among themselves to mate with the females. Usually the most dominant and heavy males mate and are fathers to most of the colony's young. Male and female differ greatly in size. The male is 20" in length (50 cm) and weighs over 18 ounces (520 gm), while the female is 15" (38 cm) and weighs about 8 ounces. Adult males are mostly chestnut-colored with a blackish head and rump with a show-off tail that is bright yellow. There is a bare blue cheek patch and a pink wattle that gives the bird an odd appearance, but who could resist it? Females are similar with a smaller wattle. Its range is listed as Gulf-Caribbean slope of Southern Mexico and southern Pacific slope of Nicaragua and Costa Rica to Central Panama. It's quite a common bird in parts of its range often seen in flocks foraging in trees for small vertebrates, large insects, nectar, and fruit. Outside the breeding season, this species moves around, so it's fortunate for me that I am getting to enjoy them during breeding season. 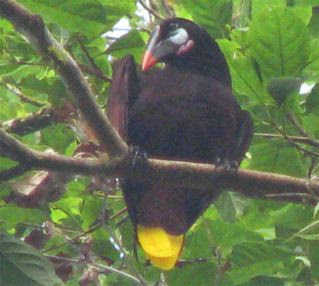 The Montezuma Oropendola inhabits forest canopy, edges and old plantations. They have chosen a tree in an open area here at La Selva. They're easily bothered while foraging, but are very confident when on their breeding tree. Oropendolas weave a large bag-like nest 2-6 ft. long that hangs from the ends of tree branches with many on the same tree. It's woven of fibers and vines high in a tree. Almost always built by females who also incubate the 2 dark-spotted white or buff eggs at the bottom of the pouch for 11-14 days. The male guards the nest. The nestlings are fed by the female with the young fledging in 30 days. There are generally about 30 nests in a colony, but up to 172 have been recorded. 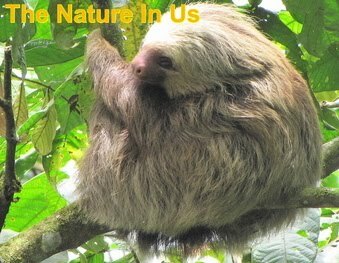 To imagine the size of the pouch nests that can be from 2-6 feet long, keep in mind that the male is 20 in. long and the female 15 in. I'm not sure whether it's a male or female at the top of one of these nests, but it shows how long the pouches are regardless. Oropendolas have interesting symbiotic relationships. They tend to nest in the same tree as hornets because hornets keep away cowbirds who will dislodge the chicks from the nest. The hornets also protect the Oropendola from botflies which lay eggs on newborn Oropendola chicks, so their larva can feed off the infant birds. 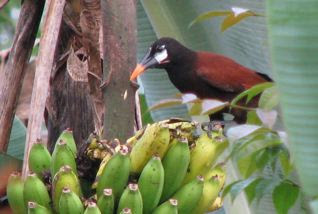 In exchange, the Oropendolas keep the bees from harming the hornets. I love these kind of nature stories. It really shows how everything is so connected.